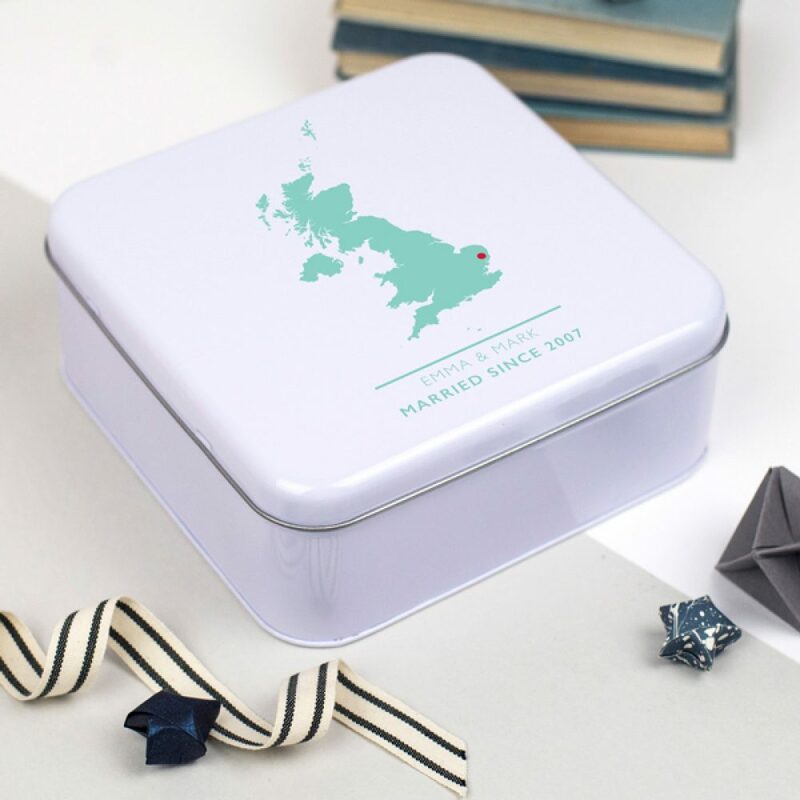 Our personalised map anniversary tin features your own special location or favourite place with your own wording. Perfect for a 10th tin wedding anniversary. 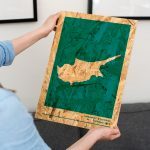 This map anniversary tin is thoughtful and unique. Perfect for a couple celebrating their 10th tin wedding anniversary, this tin is a great place to store special memories and keepsakes. 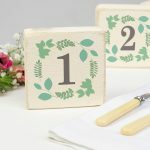 It is the perfect size to keep postcards, photos, letters, cards and small items in. 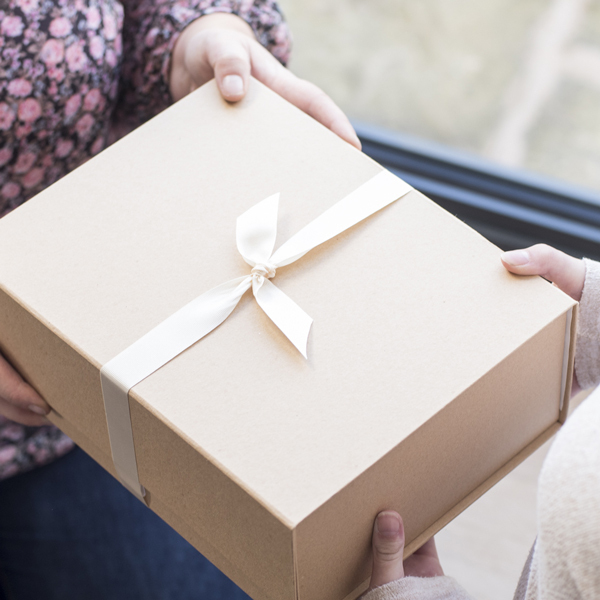 Making a personalised tin is a great way to celebrate a 10th anniversary, creating a gift that can be kept and filled with special memories. 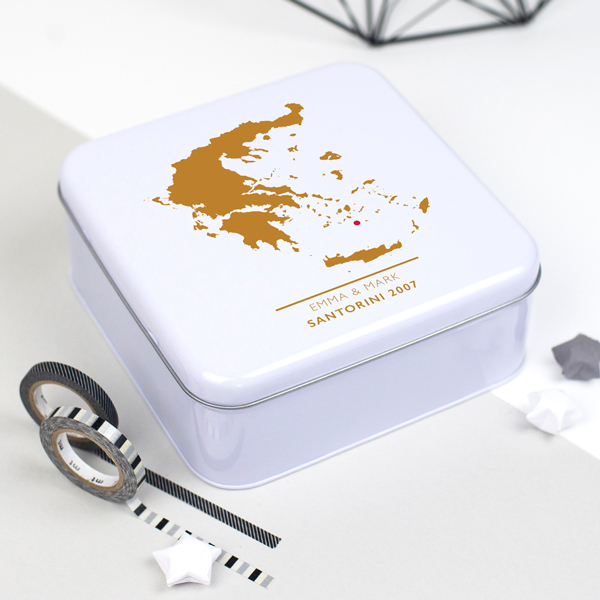 Begin personalising your tin by entering the name of the country that you would like to appear. By entering a specific location, you can add a red dot to highlight a special place within your chosen country. Then add your special wording to appear under the map. Use the // sign to denote a line break. Choose from 6 different colours; teal, gold, french grey, duck egg, dove grey or navy. 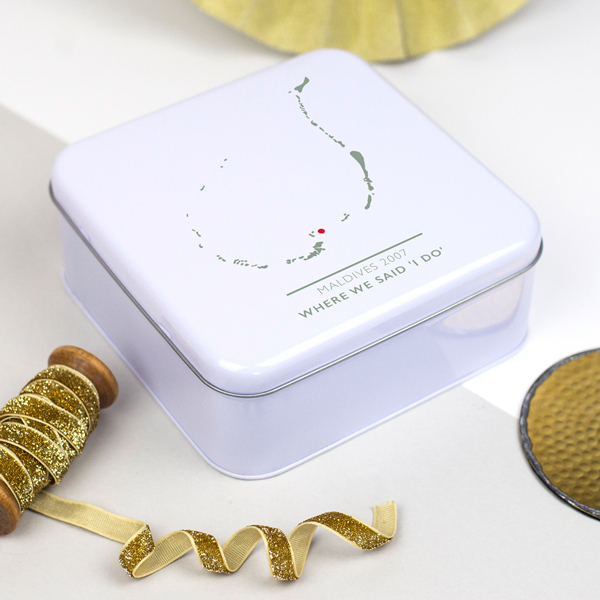 Lovingly drawn in our Derbyshire workshop and studio, we make map anniversary tin to order. 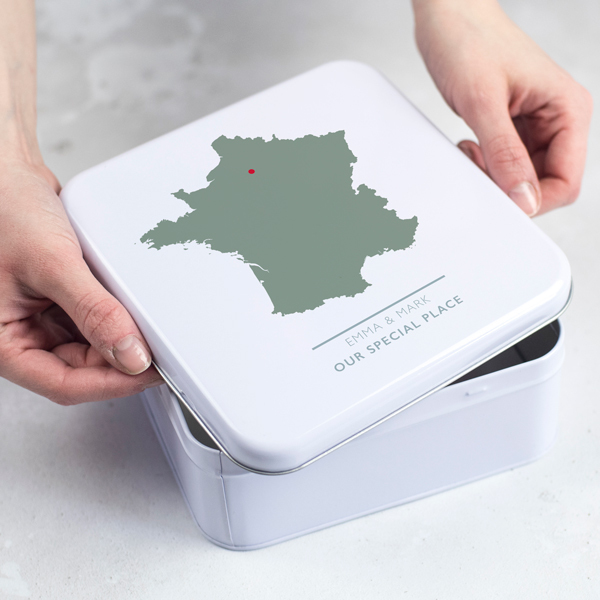 Featuring your own bespoke map and personalisation, your tin will be beautifully wrapped and sent to you. Please note that the maps are not printed to scale however are printed in a size that best fits the size and shape of the tin. 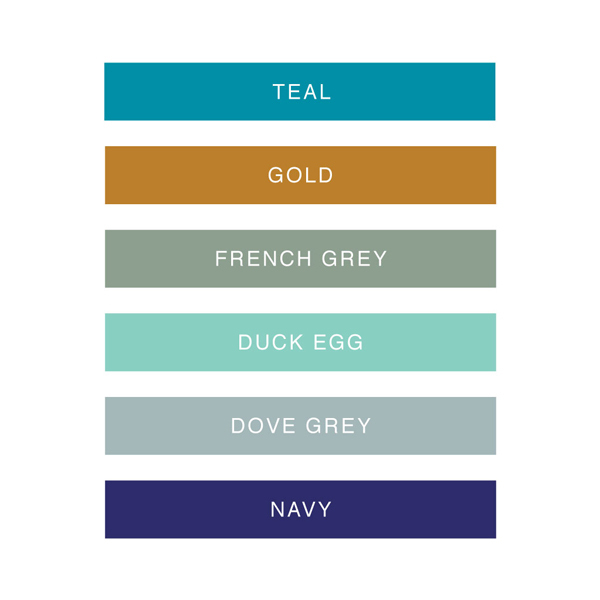 If you would like to adapt the design at all, please do let us know. Our Delightful team are always happy to help. Made from tin. 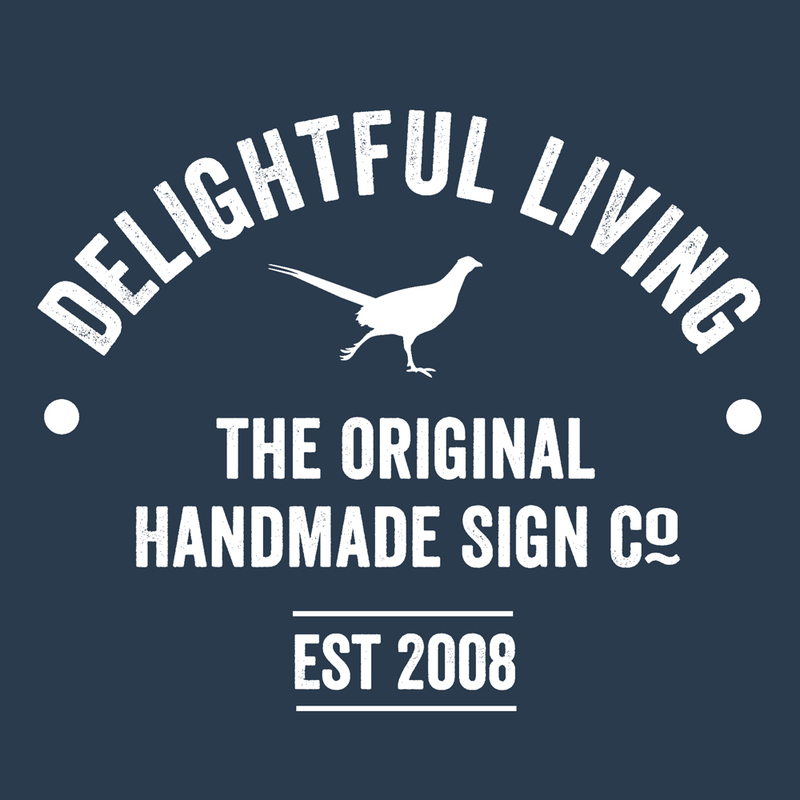 Designed and printed in our small countryside workshop and studio.